The journey to document the various Second World War examples of shoulder titles to this storied French Canadian Régiment is my homage to the service my Grandfather rendered with them from 1940-1945. He was among a considerable cadre of Acadians from New Brunswick who served with great distinction in the Canadian Active Service Force (CASF) for them. A brief historical overview will provide some contextto the shoulder title discussion. During the Second World War it was one of a few that fielded 3 Battalions. The CASF Régiment was known as Le 1er Battalion (Sept. 39-June 45), The Canadian Army Occupation Force(CAOF) Régiment was known as Le 3e Battalion (June 1945-April 1946), and stationed back in Canada as a Reserve was Le 2e Battalion(1940-1946)1a. Both the CASF and CAOF Battalions had a full complement of Other Ranks and Officers. The Reserve Battalion was made up mostly of overage and underage volunteers who committed generally one night a week for service, it comprised only 11 Officers and 174 Enlisted Ranks at its zenith in October 19451b. The first iteration of Shoulder Titles for the CASF Régiment came in the form of the trapezoid shaped Worsted Titles and Khaki Drill slip-ons. I have noted at least 2 distinct examples of Worsted Titles, with the difference namely in the thickness of the black thread. Both of these Titles were worn by the CASF from early 1940 until approximately July 1941 when they departed for the United Kingdom (U.K.). The CAOF force did not have occasion to wear either of the Titles, however The Reserve Battalion did wear them from 1942-45 as this was the only authorized pattern worn by the Reserve Army 2. Left, Worsted Title – Author’s Collection. The colours of the shoulder titles have a unique genesis. The shoulder title colours in addition to the colours of the helmet decal and the Coloured Field Service Cap (CFSC) were Maroon, Silver (White) and Scarlet. These were chosen out of tradition and respect for the colours of the outer vestments worn by high ranking Catholic Canadian Clergy when they attended Papal Conclave’s (meetings). In the writings of Captain (Padre) Turmel, it indicates that the colours were specifically out of respect to His Eminence, Cardinal and Archbishop of Quebec City Jean-Marie Rodrigue-Villeneuve. He actively helped recruit men in the spring/summer of 1940 from the rural areas of Quebec. The choice was well received as many were practicing Catholics, 3, 4, 5, 6. April 1941 saw thempurchase 500 pairs of their first coloured embroidered melton wool titles at .24 cents per Title 7. This low purchase number is striking in that at the time there were 908 Officers and Other Ranks as detailed by a medical examination board document that was prepared for their journey to the U.K. in July, 19418.The other 2 Regiments in the 3rd Infantry Division (8th Brigade) also purchased titles at the same time; their purchases comprised a much larger order. The North Shores from New Brunswick ordered 1794 pairs, and the Queen’s Own Rifles from Toronto ordered 2000 pairs. 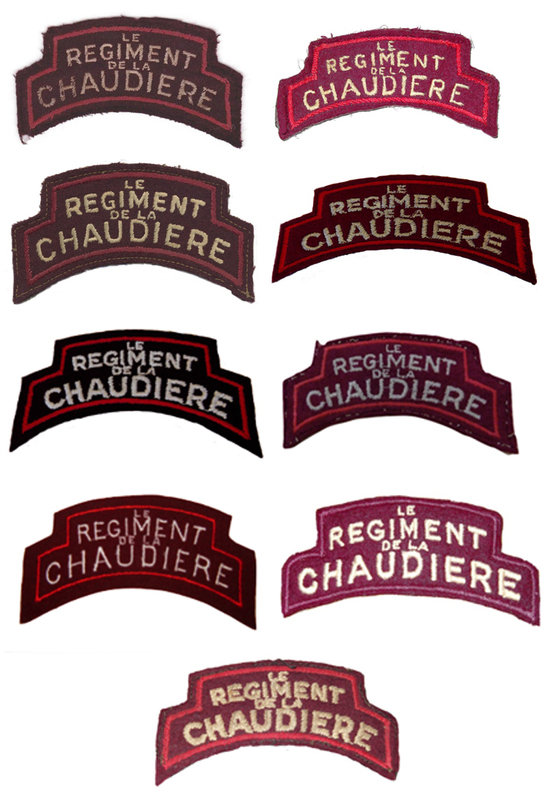 One possible explanation for the low order is that the Chaudière may not have been in a financial position to purchase a pair for each member due to the requirement at the time to pay for them out of Regimental funds9.Known examples of Canadian, British and private purchase embroidered titlesfor the CASF from 1941- 1945 are showcased and highlighted. The author welcomes submissions of embroidered titles not presented that are believed to be Second World War (SWW) vintage. Top row, left, author’s collection – Type 1 Canadian. Right, author’s collection – Type 2, British Made. 2nd row, right, J-F Le Cuziat collection – Type3 British-made. Right, author’s collection – Type 4 British-made. 3rd row, left, author’s collection – Type 5 British-made. Right, Raymond Gilbert collection – Type 6 ‘Starch-back’. 4th row, left, author’s collection – Type 7 Canadian-made. Right, Bill Alexander collection – Type 8 private purchase. Amendment to the original article that appeared in the Summer 2013 CSMMI Journal: The estimated time issued for the various types can be summarized as follows: Type 1 issued April 1941, Type 2 issued 1941-43, Type 3 issued 1941-43, Type 4 issued 1943-44, Type 5 issued 1945, Type 6 issued 1945 and Type 8 unknown issue time frame. Type 9 was discovered post publication of the CSMMI article and is estimated to have been issued 1942-43. Dates for the Type 7 are unknown and after consultation with a number of fellow collectors it has been determined it is most likely a post war variant and therefore an error on the author’s part. The author is looking to discover photographic evidence of the Title in use. In 1943, a U.K. company called Calico Printers produced printed or ‘canvas’ titles 10. There have been 2 identified patterns for the Chaudière. The first type was produced in 1943-44 and is constructed ofCotton Drill number 2. This type is made of a slightly thicker, duller and coarser canvas material. The second type was made of Satin Drill and was produced in late 1943-45. It is thinner,has a slightly darker almost reflective black cherry colour to them11. This pattern is most often associated with the D-Day Landings. Both the CASF and CAOF wore examples of these. Samples of each are provided. Author’s collection – Left, canvas 1st Type, 1943-44. Author’s collection – canvas 2nd Type 1943-45. The following images of my Grandfather depict him with various Shoulder Titles to the Régiment. The first photo was taken in 1941 shortly after arrival in the UK. This would identify this Title as being one of the original 500 purchased in April 1941. Photograph 2 is dated 1943 and as best as can be determined is an example of the Type 4 British Made Title. The final photograph was taken sometime in 1944 and appears to be the Canvas 2nd Type Title. From the left, Type 1 Canadian. Type 4 British -made. Canvas 2nd Type. Caution needs to be exercised by the collector with regards to the titles. There are a number of reproduction titles currently circulating including a number produced for re-enactors perpetuating the unit’s history. There are also a number of post war titles being marketed and or misidentified as SWW. Finally, the author has recently witnessed a number of made up Battle Dress (BD) to the Régiment that have had post war titles added. Some of these BD have been made with a clear intention to deceive and unfortunately fetched significant sums to unsuspecting Buyers. Left, Bill Alexander collection – Canvas ‘Repro’. Author’s collection – Embroidered ‘Repro’ of Type 4. The author would like to posthumously thank his Grandfather who continues to provide the inspiration and dedication to collect and research Le Régiment de la Chaudière. The author would like to thank Sally Roberts for her patience in editing and formatting the pictures. The author would also like to thank Bill Alexander (who also openly shared his knowledge and research), Raymond Gilbert and J-F Le Cuziat for the use of their titles. The author can be reached by e-mail should members wish to submit unidentified examples or if they have items from the Régiment for sale at chaudiere1944@gmail.com. Finally, any errors or omissions are the author’s entirely. Publisher’s note – please note that the shoulder titles are not necessarily to the same scale so collectors should not rely on the relative sizes between titles. 1: “Le Régiment de la Chaudière” Jacques Castonguay and Armand Ross, 1983, 1a pp. 365-432, 1b pg. 399. 2. “Canadian Army Cloth Shoulder Titles of the Second World War A Primer”, CSMMI Journal Spring 2011 – Raymond Gilbert and Bill Alexander. 3. “The Canadian Soldier” Jean Bouchery, pg. 50. 4. “Le Régiment de la Chaudière” Jacques Castonguay, Armand Ross and Michel Litalien, 2005, pgs.558-560. 5. Museeet Archives du Régiment de la Chaudière, Notes from Emile Turmel. Not published. 6. “Les Origines de noscouleursregimentaires” Richard Martin. Manuscript. Not published. 7. Library of Archives Canada (LAC). Reference provided by Bill Alexander. 8. “Le Régiment de la Chaudière” Jacques Castonguay and Armand Ross, 1983, pg. 149. 9. Library of Archives Canada (LAC). Reference provided by Bill Alexander. 10. “Canadian Army Cloth Shoulder Titles of the Second World War A Primer”, CSMMI Journal Spring 2011- Raymond Gilbert and Bill Alexander.